TTMSFMXNativeUIDocumentInteractionController component allows you to preview, open, copy, or print a file in IOS9. You can use it to send a PDF for example to a third party PDF application for editing. You pass the path of the PDF file to the third party app and it can edit it in place as one example. Basically it is your window for sending content to other apps in IOS. TMS iCL is a commercial component suite and is only for IOS and not Android, Windows, or OSX. There is a free trial available and it also works with Appmethod. Additionally, C++Builder is now supported! 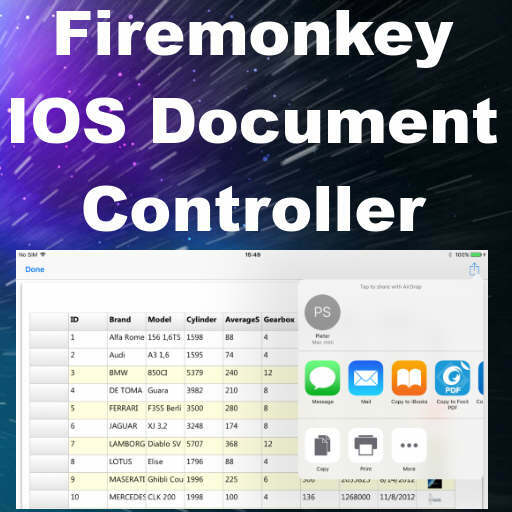 Head over and check out the full functionality and all of the great components in TMS iCL for Firemonkey in Delphi 10 Seattle.